Game of War evolves relatively quickly, and the introduction of hemlock was part of that evolution. But even with hemlock, if a rally leader loses their hero and it can’t be rescued, there’s a 45 minute window in which they can be attacked without all the combat-related benefits their hero provides, leaving them defending with only the inherent combat stats from what is currently sitting in their city. At first, burning a heroless 30B power player was unbelievable. Then somebody burned a heroless 40B account. Then heroless 50B, then 60B. And the other day, we heard a heroless 142B was burned. That’s really impressive, we thought. Until last night, in my own kingdom some of the heavy hitters in b&h decided they wanted to try to burn a heroless 220B. The defender is also from b&h, so they were trying for testing purposes/science. But they did burn him successfully, using the custom core suit below. 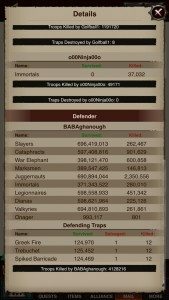 From the stats of this custom suit, you can see that every defensive statistic of the defending heroless 220B player (BABAghanough) was zeroed out, meaning ~4.1m troops were able to burn an army consisting of over 5 billion troops. Yes, that’s billion with a B. 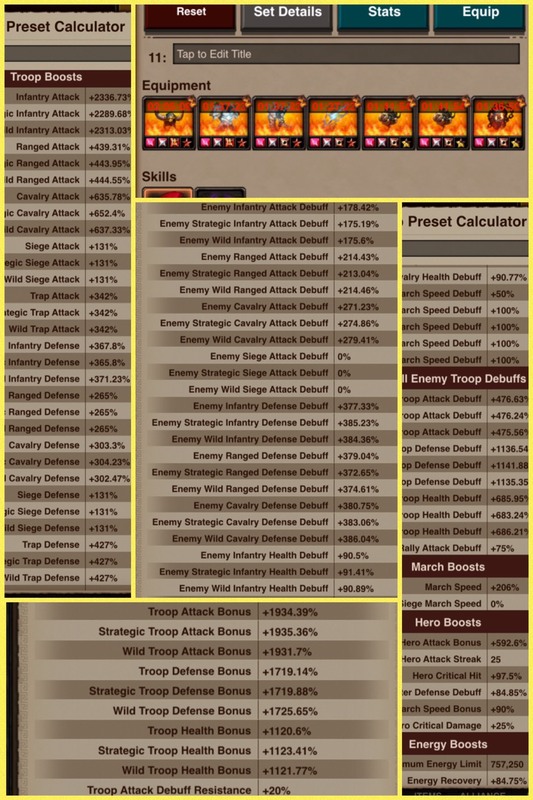 Specifically, the suit shown above zeroes out a heroless defender’s Troop Attack, Troop Defense, Troop Health, Infantry/Ranged/Cavalry Attack, Infantry/Ranged/Cavalry Defense, and Infantry/Ranged/Cavalry Health, assuming a total of 26 barracks, according to Xiownthispla, who led the rallies and crafted the custom set. Per Xiownthispla’s explanation, BABA did not use any boosts for the first hit. With no boosts, they were able to burn him handily, seen below. BABA used 200% Defense and 200% Attack Debuff boosts the second rally, and it was vastly different as the core suit no longer was zeroing out every one of BABA’s combat stats. Xiownthispla said that they only killed about 30k while BABA ate the rally and capped his hero. I don’t have a screenshot of that report, unfortunately. The third test with the defender using normal 20% defense/attack debuff boosts burned him. BABA wanted to see if he could use normal 20% boosts if he had to step away from the game for a few minutes when he was heroless. …and the answer was no, he’d still burn. Xiownthispla puts a ton of work into building sets like this so I am not going to share any exact pieces or anything of that sort. There’s spreadsheets with modeling involved, I’ll leave it at that. The lesson to be learned here is that practically nobody is safe when heroless if the attacking rally leader knows what they’re doing. Don’t be surprised if I end up writing another article once they try to test burn a 500B power member next. But wait, there’s more. The same night as the tests, Xiownthispla had a Poseidon set burning, and solo burned a 40B heroless player. He did not have a screenshot of that set, but said that he stacked all attack gems. 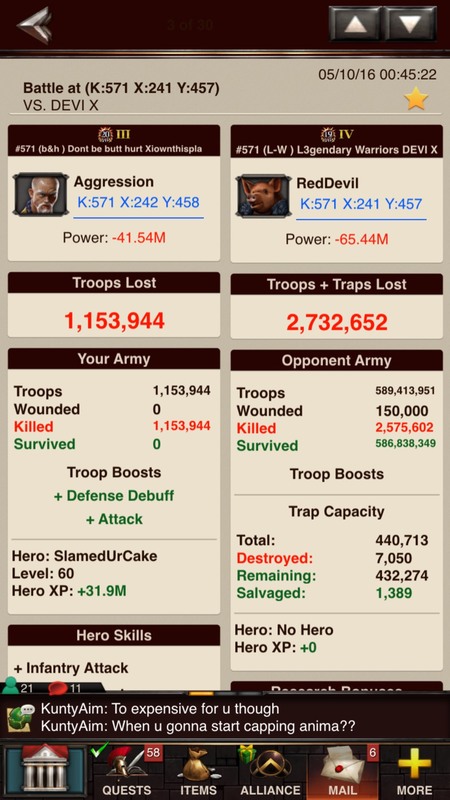 In a power destroyed kill event, this would be points positive, but not in a troop tier event. Regardless, it’s impressive. Thank you to Xiownthispla and BABAghanough from b&h in K571 for being willing to share this info. If you’ve matched this or have screenshots of other comparable reports involving a custom core suit with a good bit of math and planning for the core suit to work, please send them in to lubears@insidegameofwar.com. We love compiling more data, and the more of it we have, the more we can share here. I have been in the same situation as a lot of new players and been gangbanged by level 24 players as soon as I hit level 15. A good example for MZ would be you can’t attack any player out of the level they are on within 1 level I know this happens in other games. Glitch / fraud / loophole / cheat in GOW which MZ need to fix. 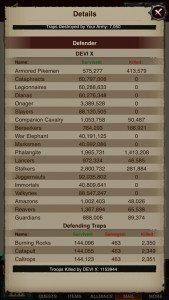 Found this out when in our kingdom – K260 Philon – a player called Count Admund popped up as the conqueror of a kingdom that is not in use, or has been made extinct – K663 Atreo. Now he is not very good and we keep capping his hero so when he started giving bad titles at will, and could change the titles without a wonder reset; we decided to investigate. What we found is disturbing. He has an alt in the empty extinct kingdom on his own, and has the alt in his alliance which is in K260, and he logs into the alt in K663 to reset the wonder in K663 to make himself the king so he can title people in K260. if you search for K663 in GOW is says bad coordinates but you can see his trick by typing in the coordinates K:663 X:259 y:515 / 663:259:515. So if you rally his alliance he bad titles you from the non-existant kingdom, or gives good titles to his friends at will – and no need for a wonder battle or reset. I would not be highlighting this, but for the smaller players in the game who have spent good money, he is zeroing them with this cheat. I am well over 100 billion so he cannot attack me without losing badly, and losing his hero. But for the smaller guys in the game who are under 10 billion, he is bullying them and cheating. 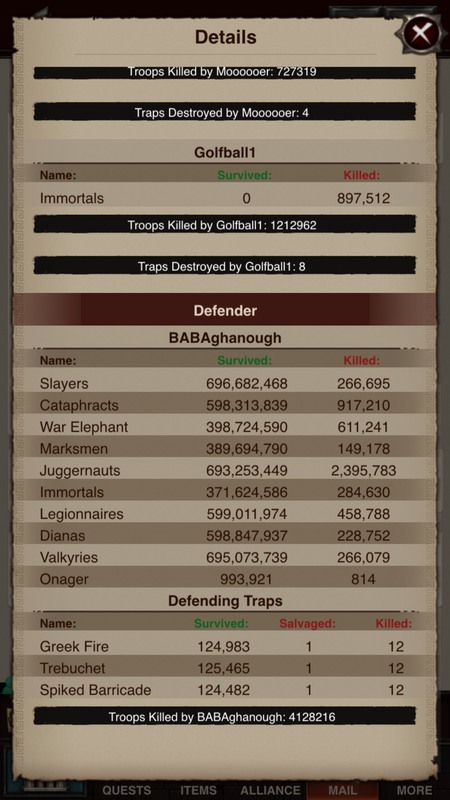 Please get this glitch/cheat stopped, or you should ban Count Admund of D18 alliance in K260 Philon as his cheat/fraud is costing people money. This is also becoming a legal issue. 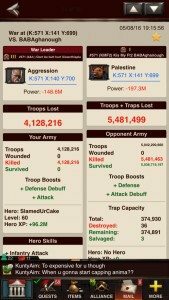 The stats in the screenshots include research and skill tree – that alone gives you 740% troop attack on a maxed account… You seem to be only looking at your pure core stats, instead of factoring in all boosts, which the screenshot does. I am starting to sense desperation and defensiveness from some of the contributors making comment, and that is understandable. I sense it with MZ too. It’s hard for someone to hear the truth and even harder when comments are directed at those who have fallen and continue to fall for a con from someone that actually experienced it themselves but had strong enough will power and self control to eventually recognize it for what it was and stop falling for it. All con’s and scams have something attractive, otherwise they would not work at all… so we see those things that are attractive paraded around, touted, and repeated over and over, but the criticism’s from those giving it are never adequately addressed; that’s understandable because most criticism directed at this game and developer is spot on and its generally indefensible. So the, It’s their money, why do you care, or if you quit, why are you here commenting types of things are used and nothing more than comments to deflect the reality of the game or facts of what others are saying. I am pretty convinced there is also a fair share of stake holders in MZ or their business making some of the defensive comments too… I call them MZ gravy train riders… they’re pretty easy to spot in game too – and there are lots of them in all aspects of their marketing business. It will be interesting to see how this game that was once a decent pastime gets decommissioned and the gravy train riders get dumped… I think anyone that thinks there is still a strong interest and vibrant player community for MZ games is in deep denial. Will they go out with a bang with a big middle finger to all those who continue to fall for and support the con game, and failed to see the writing on wall, OR will the games just wither away in a un-maintained and broken state of disrepair making them more unplayable than they already are until there is such low activity on the servers no one will even notice if they get shut off… To be seen I guess – but it’s coming and I believe it will be soon. Meanwhile MZ will try to transition into some type of credible cloud/infrastructure provider type service to capitalize on the remaining shelf life of the hardware they put in the racks. Got to love it… be interesting to see if they can find some washed up celeb to lend credibility and tout the future internet, today. That’s the way they roll… all smoke and mirrors. How is it a con? You are told what it costs, sites like this one and Gow community even post the resources required to max out new research so there is no hidden agenda really. What you are stating is disappointment due to expectations not met, whatever they were. How do you justify trolling the game site though? 8 months out of the game and you write this lengthy post, sounds like a guy who got dumped by a gf 8 months back and he still talks about how bad she was. If your mission is to warn the public of overpriced product that doesn’t justify the cost there are plenty of other places you can do it: diamond industry, exotic car industry, art industry…I think you get the point. What I sense is bitterness of quittig because of inability to keep up and now you want others to follow suit so your actions are justified to self. I do not work for MZ, I am not this site contributor and im simply annoyed that you take up comments for trolling while you are not even using the site or playing the game. We get it, you don’t like the game…move on. I am afraid cheeky bugger is right my friend. I love this game and think it’s the greatest thing since the wheel, but even i can see the writing on the wall. I am on it constantly, nearly every day. They(MZ) are out pricing themselves. The game is always being updated and to get to the higher levels through upgrades it’s costing more and more. Soon all that will be left are millionaires and even the rich will soon get tired of it. I give it about 2 years and either the MZ ship will sink or they will sell it to another group. I believe they will sell it. Hopefully the next group will do a full overhaul of the game and make it less expensive to play. The game right now is only catered to the rich and more rich. So many are saying it is too expensive and moving on to other things in life. My only hope is that the new group will make it less expensive and have a level playing field. That would make the game fun again. After all it is ONLY A GAME! Sigh. Sounds a lot like Jeff made a new email to troll the site on. I can’t believe people are still playing such a flawed game. 4 million troops defeating 5 billion troops, seriously? I can imagine that in the game developers world there is a collective laugh happening around the world….HAHAHA those idiots are losing $500 worth of troops in one hit and they are still buying virtual packs to replace them HAHAHA They don’t even realize the game developers make it possible to defeat anyone if you spend enough money…they think they are “cool” or “skilled” HA! It never even dawns on them that it’s so incredibly impossible and unrealistic that it shouldn’t even be named game of war, it should be named game of extremely unrealistic battle scenarios that you pay money to participate in. they play because they have fun, nearly every game in history is flawed in some way or anoher. if you think it isnt fin, don’t play. if you think it is play. SIMPLE. …so you leave comments bashing these guys on a site about the game? What they do with their own money doesn’t affect you in the slightest. There’s time and calculation that goes into figuring out the stat values a rally will need to burn a giant heroless target versus splatting against the massive amount of defending troops, and these are the results of that time/calculation. 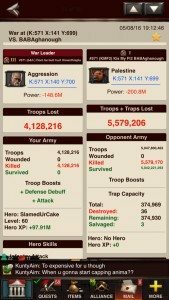 Part of what a lot of people like about Game of War is this relatively nuanced mathematical aspect of the battle algorithm. And that giant players still can be burned. I assure you, nobody here is still playing the game because of the stunning, current generation graphics. I’ve burned 214 bil myself with 200% boosts applied and it seems to be close to the cap if defender boosts. 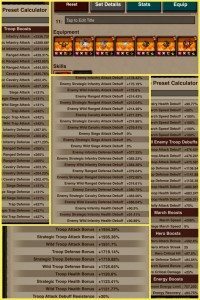 Having said that I believe the screenshot of cores and stats to be fake to mislead people. Chocolate gems are troop Attack debuff which would be useless in sending your entire March to die against 5 bil troops. And those stats are not easy to reach so you need every gem space. Also all the stats listed appear to be dead on without wiggle room, which again is highly unlikely given core quality range. It seems those who have crafted this set are trying to mislead others to discourage trying. I just prefer saying that I like to keep my recipe private. I, along with others in 571 were watching the tests. BABA burned, and that set is what X was wearing. We couldn’t see gems obviously, so I can’t specifically confirm those, but I’ll vouch for these guys. X and b&h know what they’re doing. I mentioned the attack debuff values/gems to X already, and he was basing the attack debuff premise on mimicking one of the reasons Poseidon is so effective I believe. I suggested more attack instead of the attack debuff to hopefully give him some more wiggle room in the results, but I haven’t heard back yet. And like it says, when BABA boosted with 200% boosts, he capped and lost almost nothing (30K or something). X also said the suit would need to be adjusted for a different barracks count. It was more or less crafted specifically with test hitting BABA (or smaller) in mind from my understanding.
? what I meant by 200% was the defender boosting and you may know the reason for the hero loss at this point. And the cap I was referring to is the power/troop cap/max to burn. They are real. There’s several variations for each troops type. 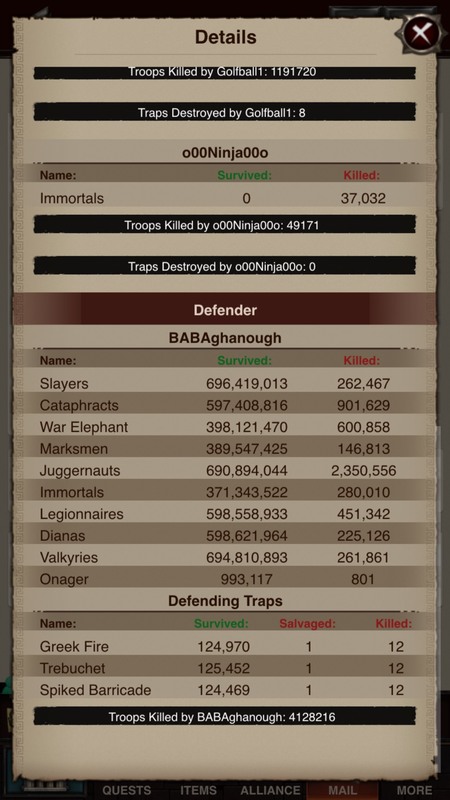 399% is max troop attack bonus on a heroless (no hero in prison, title, etc). 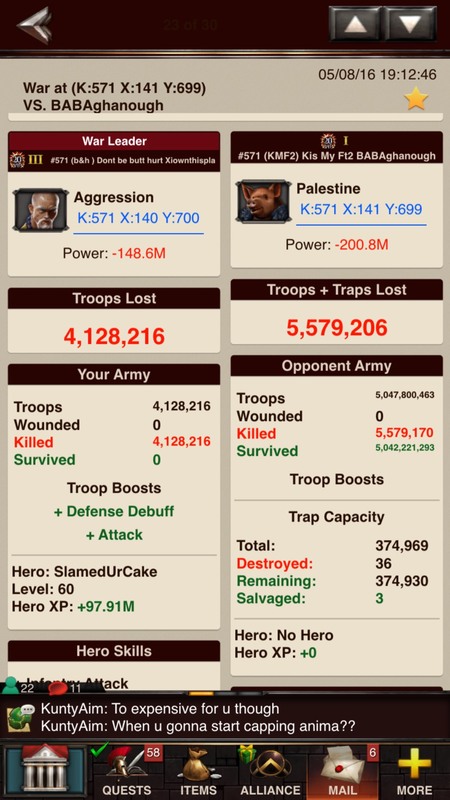 He added chocolate gems to bring it over 400% troop attack debuff…which make sense for the overhead. 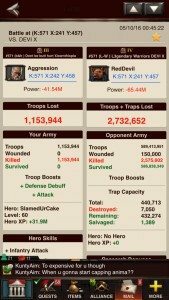 To get troops attack in 1900% and each troops attack debuff in 300% is amazing. Quick question, and maybe my thinking on this is wrong, but wouldn’t Xiownthispla have been better off not worrying about attack debuff? I know some of the best attack pieces do come with attack debuff also, but why use the chocolate gems? I know this was a test, just didn’t know if he had a reason to it. Yep attack debuff serves 0 purpose when hitting a big target where you lose full march. defender has such significantly high amount of wild troops in his setup, something like around 40% of his troops. does that sorta also help contribute to the offensive stats in burning him? Not inherently, but yes because they hit with Immortals.